Aveeno is a natural bath and shower oil which soothes itchiness and helps to rehydrate the skin. To begin your order of Aveeno oil, press the green button below and, if your order is approved before 3 pm, our UK regulated pharmacy will dispense and dispatch your order via next-day discreet delivery. What is Aveeno bath and shower? How do I use Aveeno bath and shower? 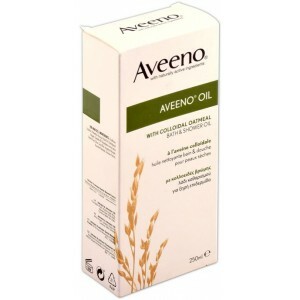 Aveeno bath and shower is a moisturising bath oil which is used to treat dry skin. It contains oatmeal, mineral oil and sunflower seed oil. Dry skin is an often uncomfortable condition which can cause patches of red, itchy and flaking skin. When scratched, the skin may break easily. Aveeno is effective for conditions such as psoriasis, eczema, dermatitis and senile pruritus. The outermost layer of skin (also known as the stratum corneum) has a layer of natural fats and oils (lipids) which prevent moisture from escaping. Too much washing can wash this protective layer away, allowing the skin to dry out. Aveeno contains a mixture of natural oils and finely milled oats. Together, they are effective at fortifying the skin to help it retains moisture. Colloidal oatmeal is a natural emollient which helps to smooth the skin and prevent moisture from escaping. The mineral oil and sunflower oil of Aveeno act similarly to the natural oils on the skin, producing a thin layer which revitalises the skin. When used regularly, Aveeno can help moisturise your skin and prevent scaling. To use Aveeno in the bath, add some to warm, but not hot, bath water and bathe for 10 to 15 minutes. To use Aveeno in the shower, apply a small amount to a wet sponge or flannel and rub onto wet skin. Take care when using Aveeno as it can make baths or showers more slippery. All medicines have the potential of causing side effects, though not everybody gets them. It's important to be vigilant of side effects while using any treatment. These side effects are rare and usually the sign of an allergic reaction. If you experience any of the above side effects, stop using Aveeno and speak to your doctor or a pharmacist. You can find your nearest pharmacy using the NHS' Find A Pharmacy service. What should I do if I accidentally get some Aveeno in my eye? If you get some Aveeno in your eye while bathing, rinse your eyes with warm water, taking care not to wash the oil into the other eye. Always keep medicine bottles out of the sight and reach of children. Can I use Aveeno bath and shower oil when pregnant or breastfeeding? Yes, it is safe to use Aveeno bath and shower oil when pregnant or breastfeeding. Can I use other moisturising products alongside Aveeno? It is safe to use other moisturisers while using Aveeno. No interactions have been reported between Aveeno and other medicines. It is recommended to wait at least 30 minutes after using Aveeno before applying any other moisturising products. Description: Aveeno is a moisturising body wash which replenishes the natural protective layer of the skin to keep your skin soft and hydrated.